NEUROSALES: Among the first consultants in Europe we focused our attention to new discoveries in the area of Neuroscience. 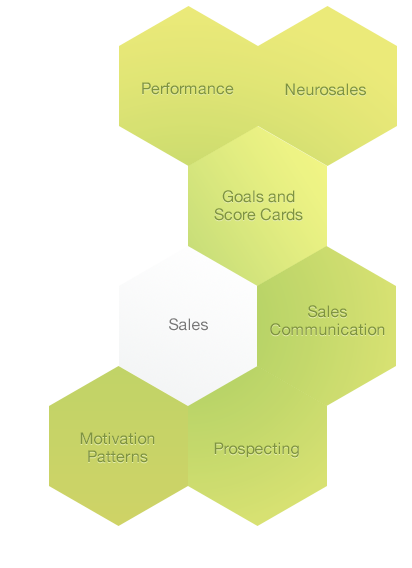 NeuroSales is a comprehensive sales communication model relying on recent discoveries about emotional processes and decision patterns of your customers. A revolutionary approach and a completely new way to your sales success. SALES CHANNELS: Are you still waiting for the customer at your shop’s entrance? Now you can mix all sorts of technological solutions for your sales offer, e-channels fully integrated with social web and the most recent e-promotion strategies. MOTIVATION PATTERNS:Motivation of your salesforce is an essential element of success. Incentive schemes are just a small piece of that mosaic. An entire psychological toolkit is available to take your sales to the next level…. PROSPECTING: Strategies and tactics for the inquiry of your market and target groups. Feed your databases with full potential prospect customers using psychological and social web based tools. SALES COMMUNICATION: Salespersons need new resources, more than just objection management and classic sales techniques. We offer a full set of advanced sales communication and sales training methods. From Active Sales to NeuroSales and integrated CRM pipelines – just decide the way you want your salesforce to be….